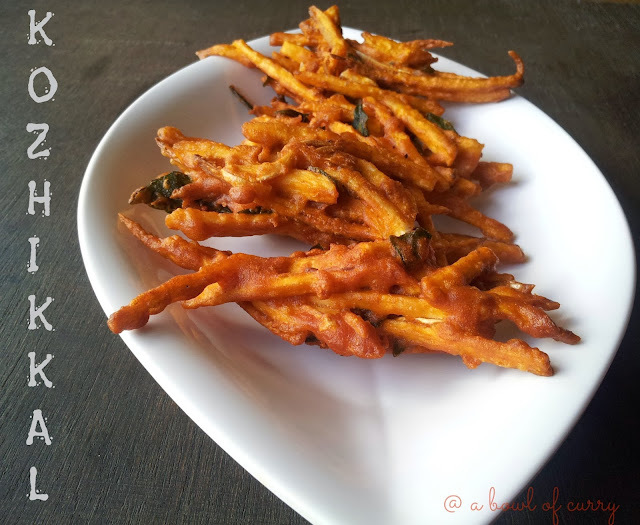 'Koorka' is also called as Sheema Kizhangu/Chivakizhangu in Malayalam. Siru Kizhangu in Tamil and Sambrali in Kannada. I searched a lot on internet about different names in different regions names and uses of Koorka. This is what I got. It is called 'Chinese Potato' in English. 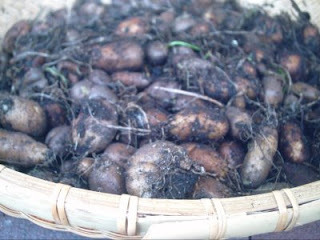 These are tubers which are oblong or oval in shape and are around 2“long. They are dark grey or greyish brown skin and white or cream colored flesh. 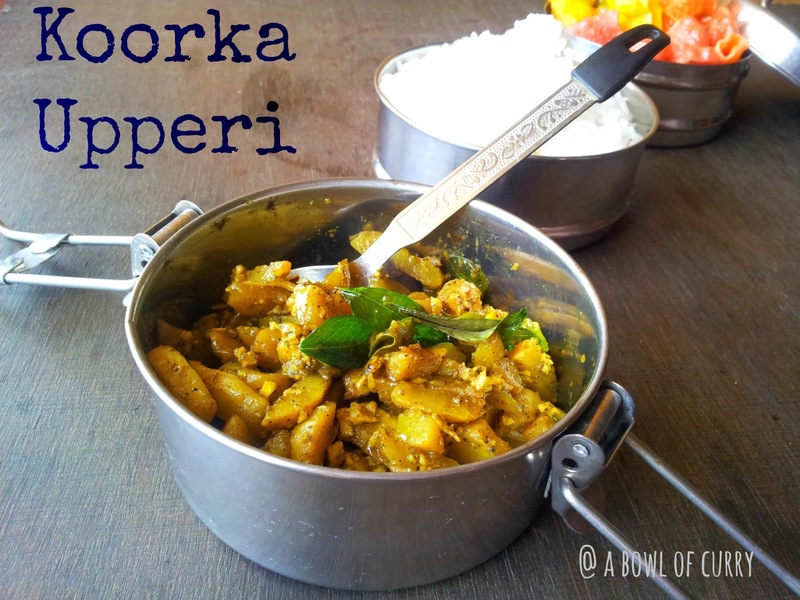 It’s not hard to explain what Koorka is all about to a Mallu. 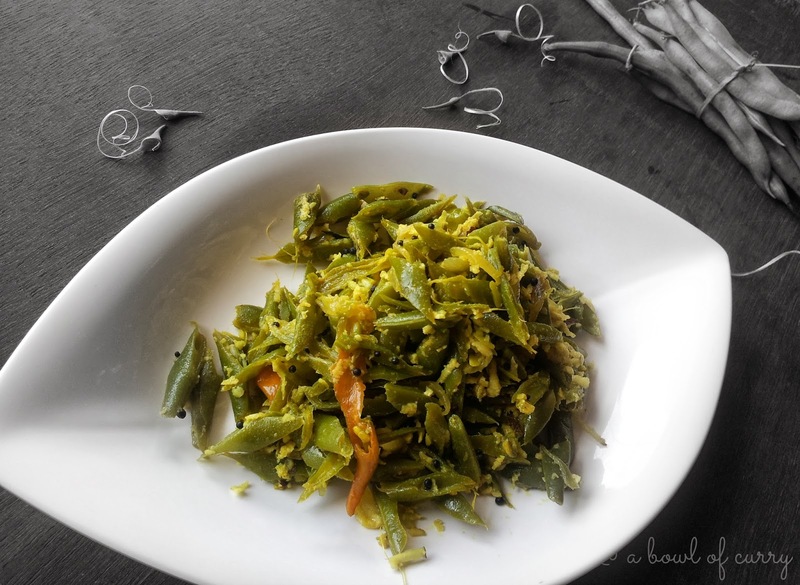 It is every Mallu’s favorite seasonal veggie available for 3-4 months during the winter season in Kerala. It has got a very distinct flavor. According to me, it has got a very aromatic and earthy flavor. 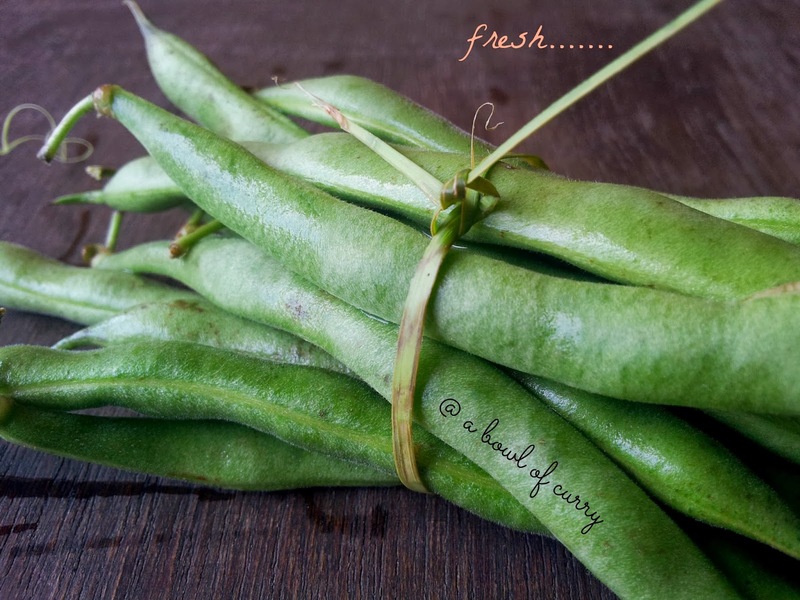 For me it’s hard to resist, when I see them in markets, I just grab a handful and ask my husband please please !!! At last he will say OK. Though it is good with flavor and all, difficulty comes in handy, when it comes to the cleaning part. It is a quite messy job,needs time and patience. What we require is an old jute sack piece or any piece of cloth. Just put the Koorka inside the sack piece, hold it and beat on a hard surface until its skin peels off, then scrape off the remaining skin using a knife. You might wonder what this is? 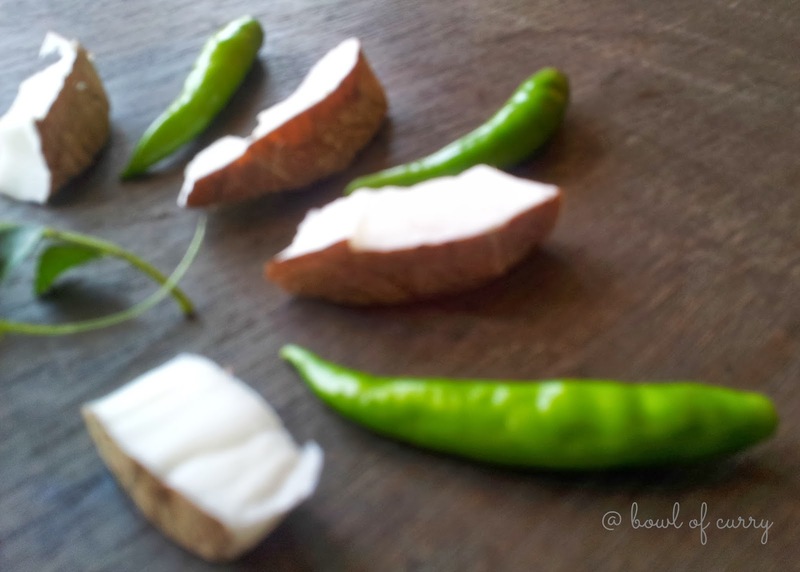 but this is a usual household task in Kerala, when we get fresh ones. But it is worth trying. 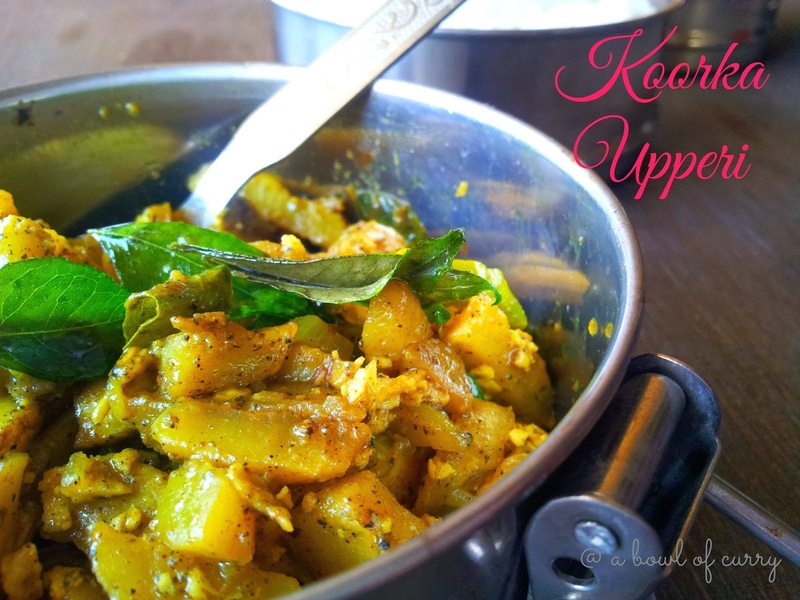 Now that’s enough let me come to my recipe of 'Koorka Upperi'. 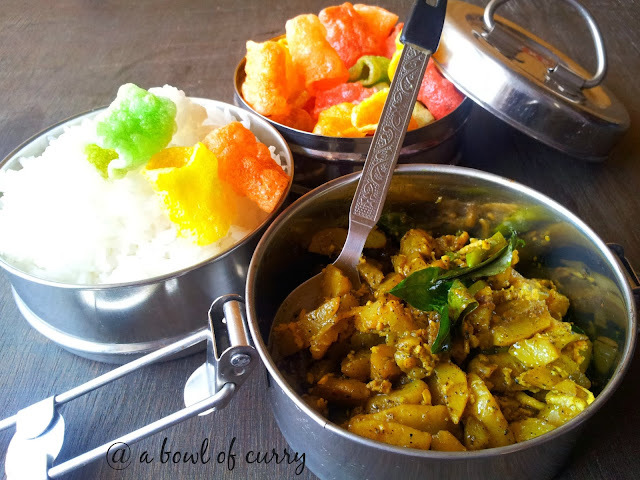 Wash , clean and cut koorka into small cubes and put them in turmeric water. 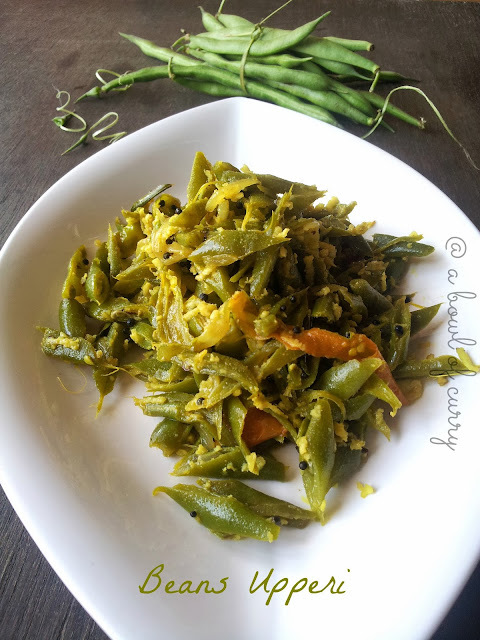 Drain i in a bowl and add grated coconut,green chilli slit, chopped onion, pepper, red chilli and tumeric powders to it and mix well with your hand/spoon. Heat oil in a kadai, splutter mustard seeds, add dry red chillies and curry leaves. Now add the prepared mix of koorka and 3/4 cup of water to it. Cover and cook until, koorka is cooked through and soft. 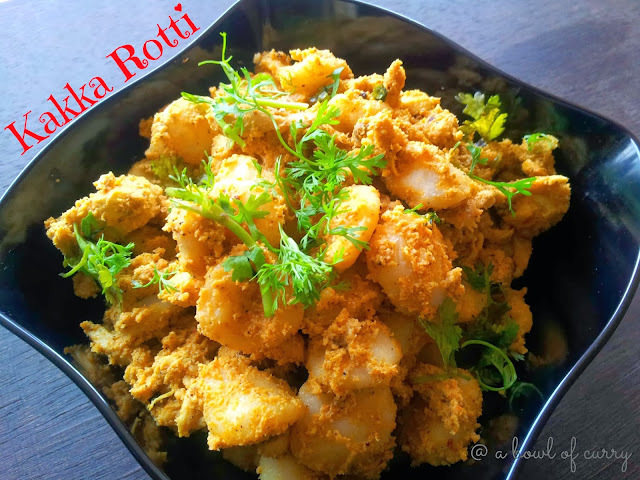 Ways to clean and cook Koorka. Wash the koorka in water numerous times till the dirt and sand is completely gone. Just put the Koorka inside the sack piece, hold it and beat on a hard surface until its skin peels off, then scrape off the remaining skin using a knife. Wash and pressure cook for 1-2 whistles and peel off the skin. After removing the skin wash well under running water and cut them into small cube sized pieces. Put them in water until they are ready to cook to prevent them from changing colour to brown. 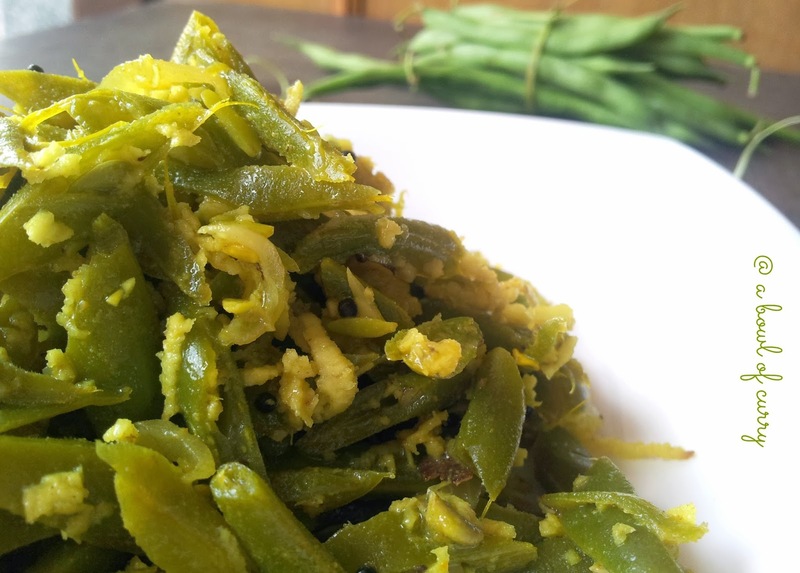 Green Chilli - 3- 4 nos. If you use a mixer , it gives a different taste . Curious about how it looks like? I dont know what it is exactly called in English. 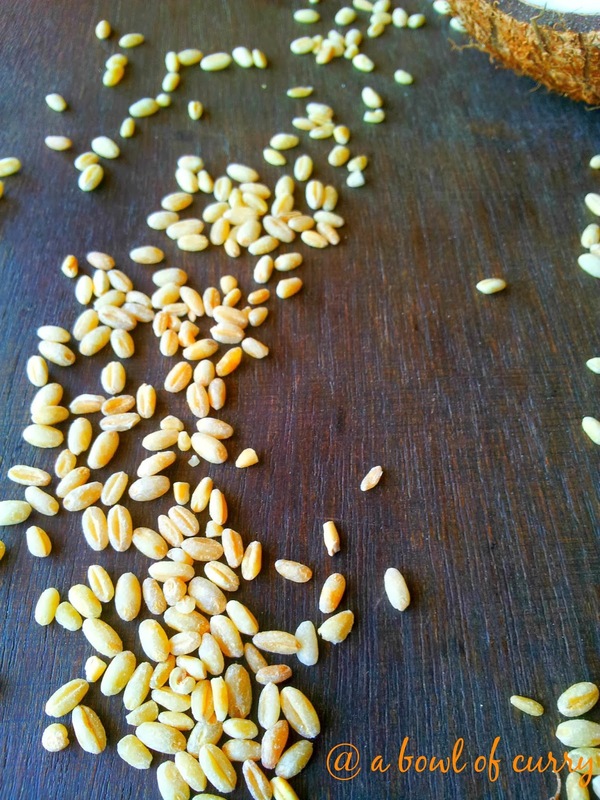 Clean and pressure cook the broken wheat either with 4 -5 cups of water or with both water and third extract of coconut milk to 6-8 whistles. (Refer Notes). In another bowl melt jaggery with 1/2 cup of water. Strain the melted jaggery . Reduce the flame of the pressure cooker. Now slowly pour the melted jaggery to this. 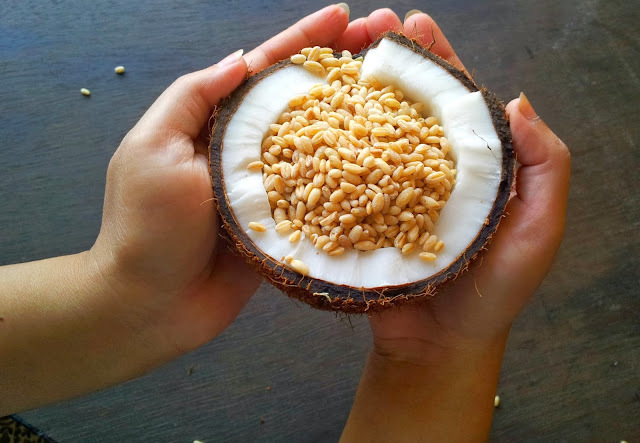 Also add the second extract of coconut milk to it and boil. Remove it from fire. Add dry ginger powder and mix well. 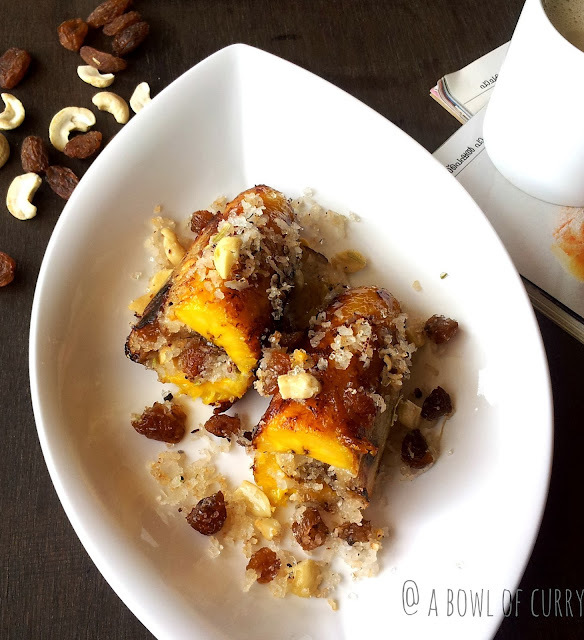 In a pan, heat ghee, fry cashew nuts and raisins, off the flame and add cumin powder. Immediately pour this along with the ghee to the hot paayasam. Keep it unstirred for about 10 minutes and then mix it well. Pressure cook broken wheat for 6 - 8 whistles. I cooked on high flame for 5 whistles, checked if cooked, and cooked on low flame for 3 whistles. If water is absorbed, do add boiling water to it. Never add normal or cold water as the cooked wheat might become hard. 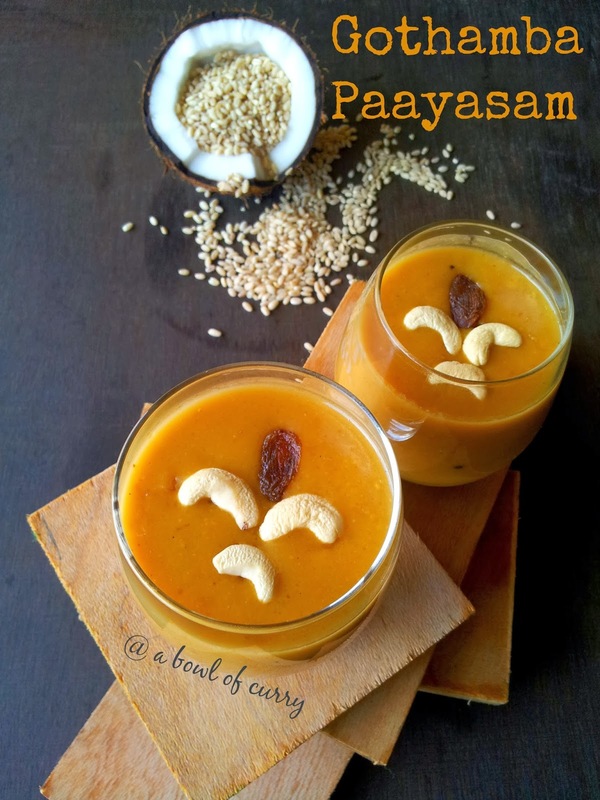 The colour of the paayasam depends on the type of jaggery you use. 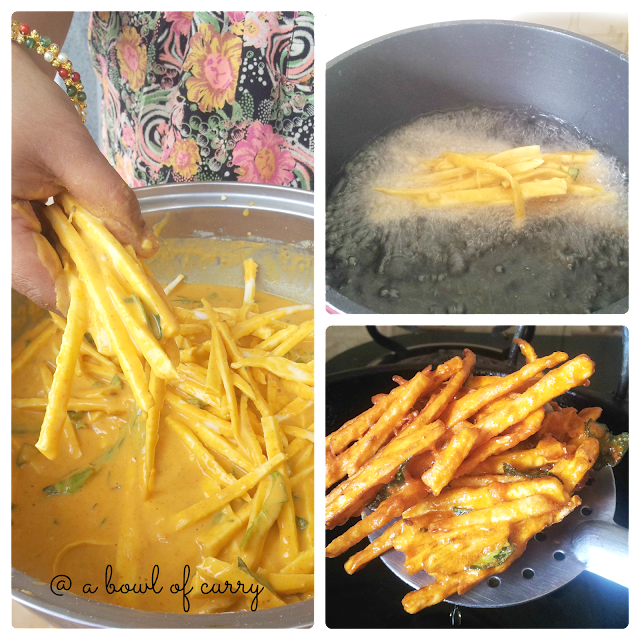 If you boil the paayasam after adding the thick coconut milk, it ends to curdle. 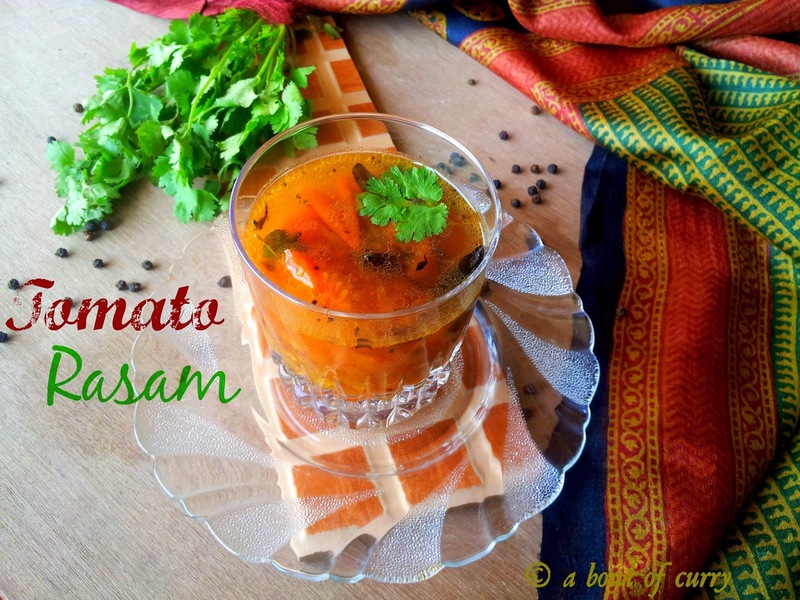 The paayasam tends to thicken when it cools. If it is too thick you can add warm milk. Don't fry the cumin powder as it will give a different taste to the paayasam. Kakkarotti, again here i come with yet another well known dish from Malabar.In different areas of Malabar it is called in various names as Kunji Pathiri, Kunji rotti, Kunji pathal and goes on.I tasted this dish , when i had been to my daughter's friends home, as they had invited us for Ramadan. 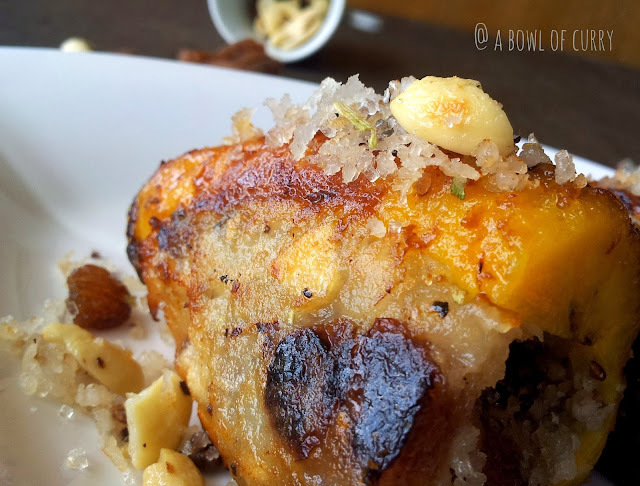 This dish and many others were very new to me..Since i have started this blog, i am recollecting many dishes from the past. 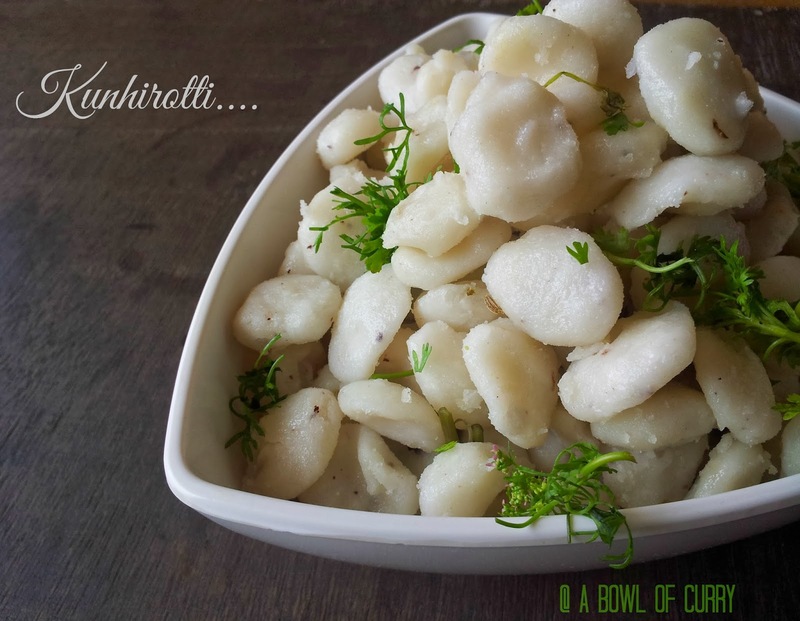 This is one of the dish i loved to make at least once a month at home. 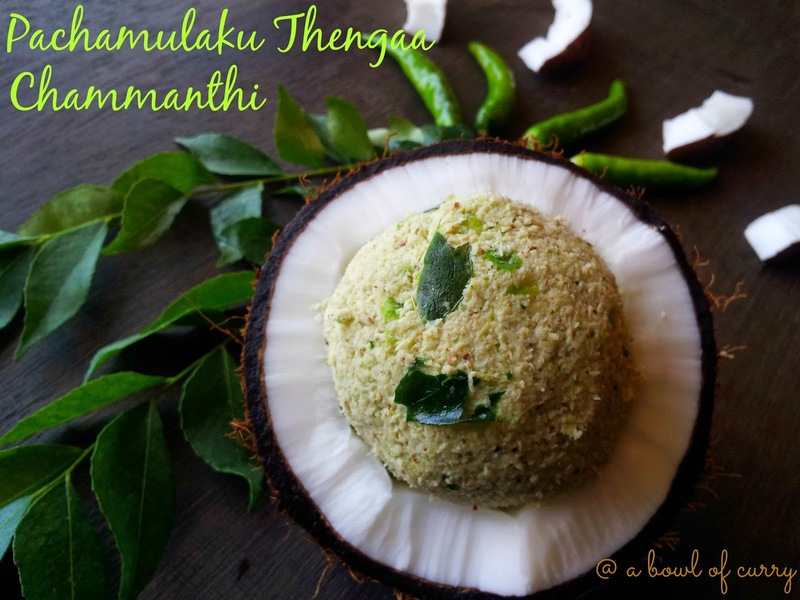 In a mixer, add shallots, grated coconut, fennel seed and grind it. 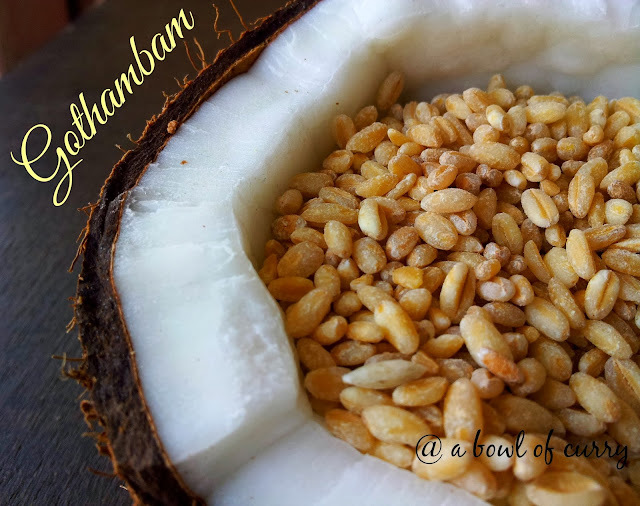 Take the pathiri podi in a bowl, add the grounded ingredients , salt , mix it and slowly add boiling water to it. Mix well with a spatula. Mix and make a thick and smooth dough. Grease your palm with little oil and make small marble sized balls. Slightly press the center of the balls with your finger to give a good shape. 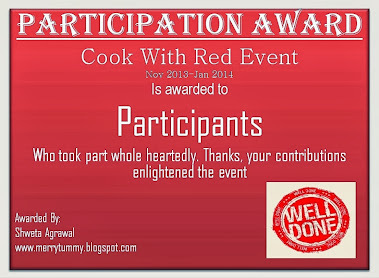 (I just love to do this and make my daughter also help me ... also she will be behind me when i am cooking anything special.. to take down the notes and the measurements... ). Steam this for 20-25 minutes. Transfer it to a plate and cool it. Steam the remaining balls also. 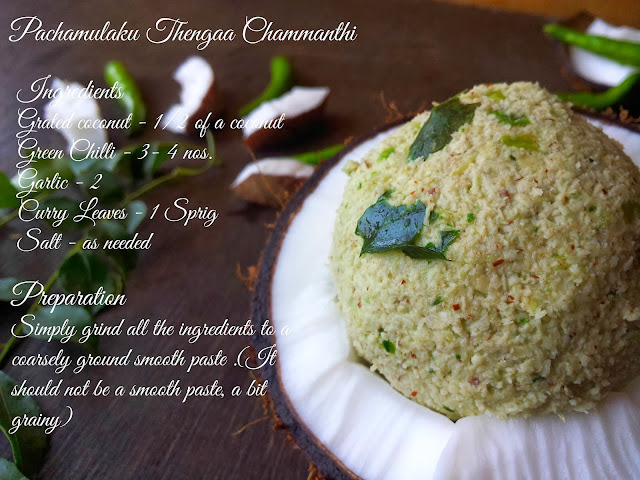 In a mixer, grind grated coconut, onion, green chilli and fennel seeds. Grind to a coarse paste. 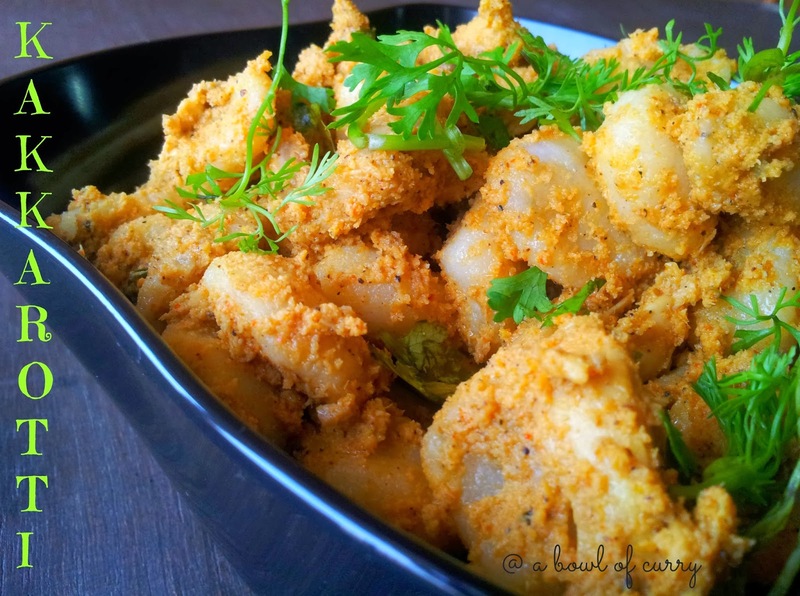 Heat oil in a pan, add the coarsely grind masala to it.Let the raw smell of the masala go and cook the masala. Add turmeric and red chilly powder to it. Adjust salt. Add the cooked and chopped chicken pieces to the masala. Mix well.Saute for 3-5 minutes. Add the rice dumplings to the masala. 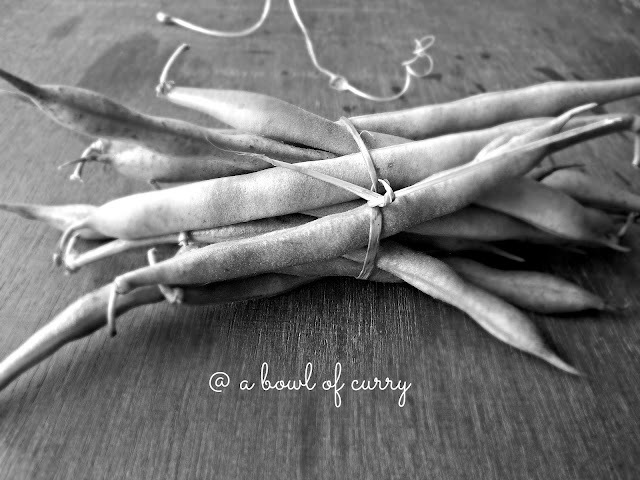 Mix well and add garam masala to it.Also add the stock water if needed. 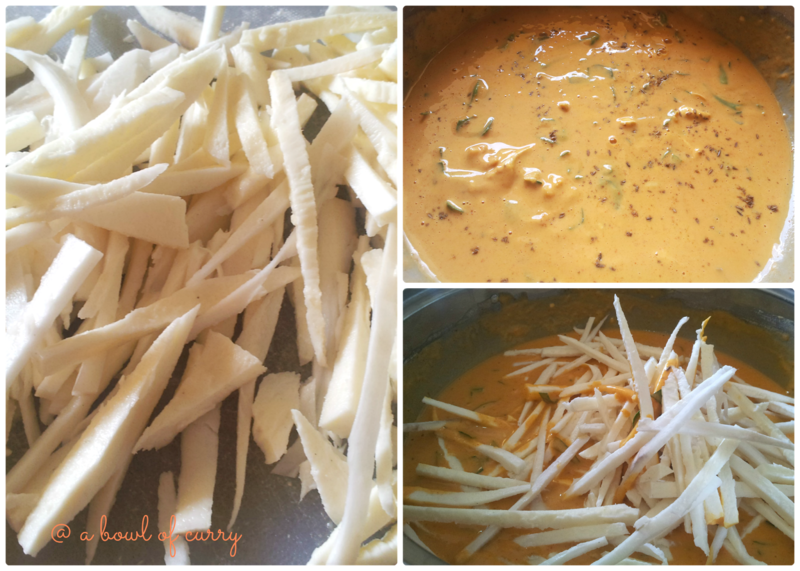 Cook for 5 minutes until masala is well coated and the sauce becomes thick. Finally garnish with curry leaves. 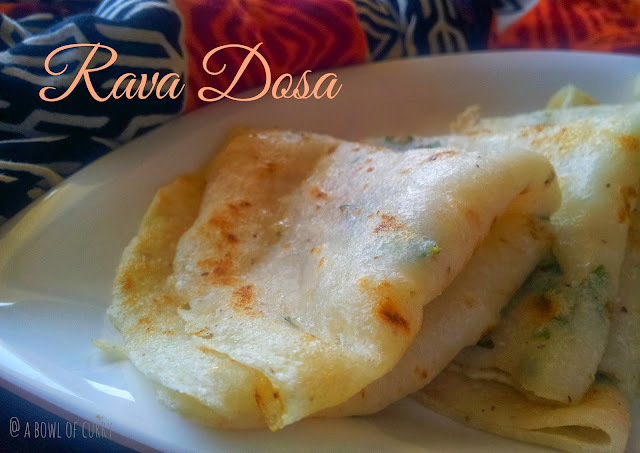 Rava Dosa is crepe made from semolina and flavored with coconut,onion and curry leaves. It is a favorite dish at my home served hot hot. If i forget to soak rice for dosa,but still need to satisfy the craving for it, then Rava Dosa is the answer as it does not require fermentation or any advance preparation.hurray!!! 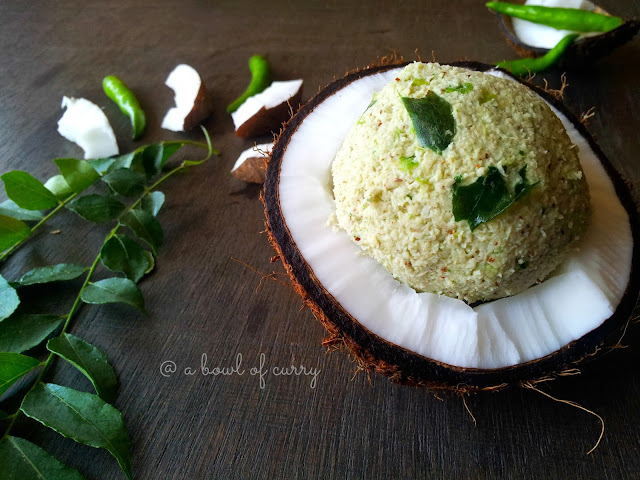 In a bowl, mix rava, grated coconut, curry leaves , onion chopped and salt. Make a batter with enough water to a consistency dosa batter. Keep the batter aside for about 20 minutes. 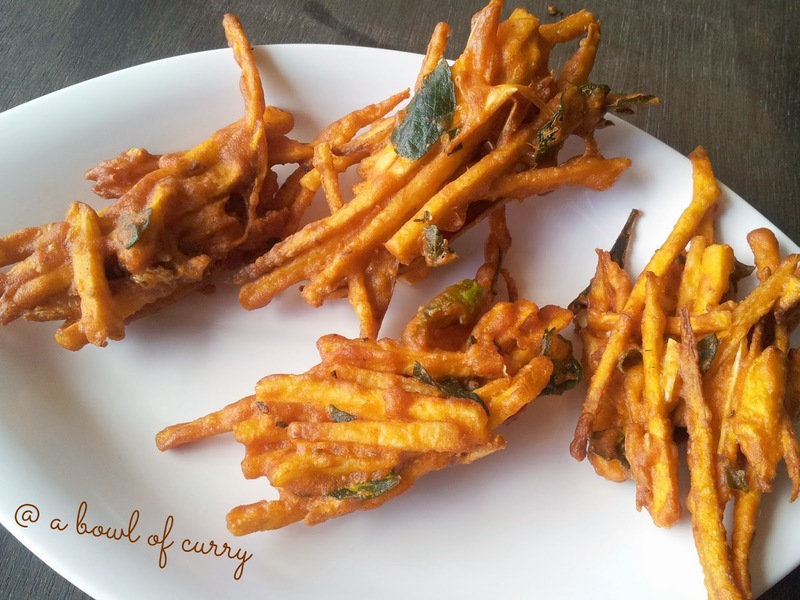 Heat a tawa or a non-stick pan, stir the batter with a spoon, pour a ladle of the batter and spread in a circular motion. Cook for 2 minutes. 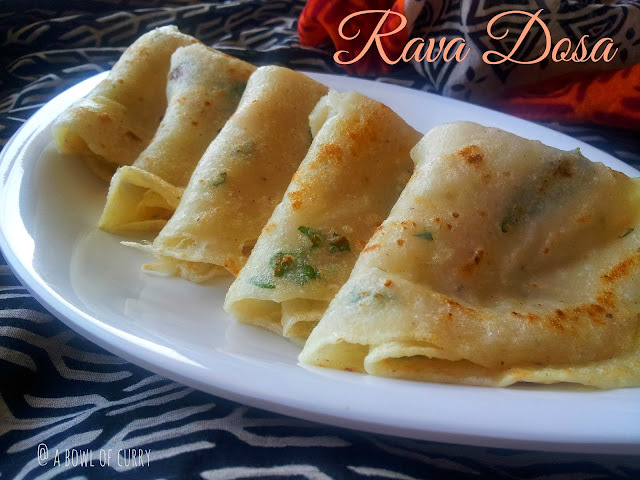 Sprinkle few drops of oil on top and flip dosa. 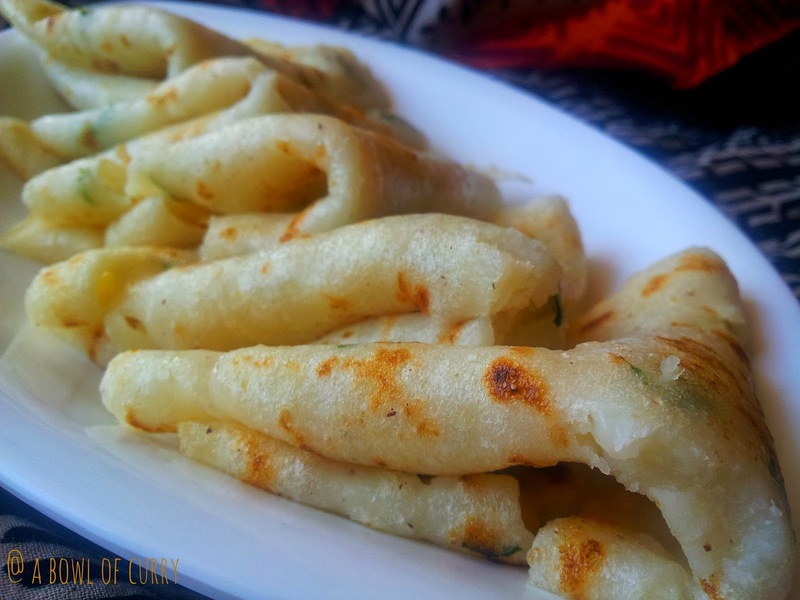 Dosa read to be served with any chutneys. 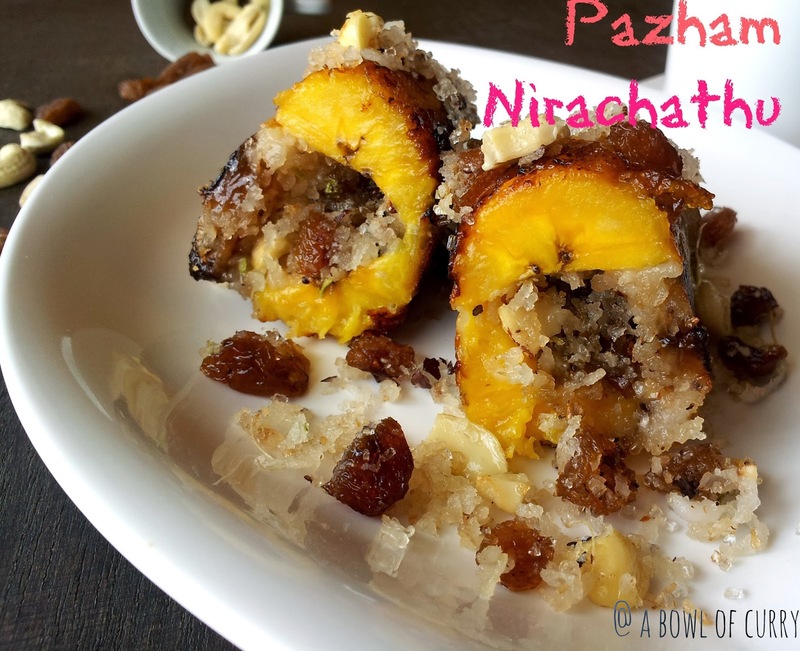 Today also i am posting another famous snack from Malabar "Pazham Nirachathu" / Stuffed Plantain. This is a very tasty and inevitable snack prepared for evening tea time. 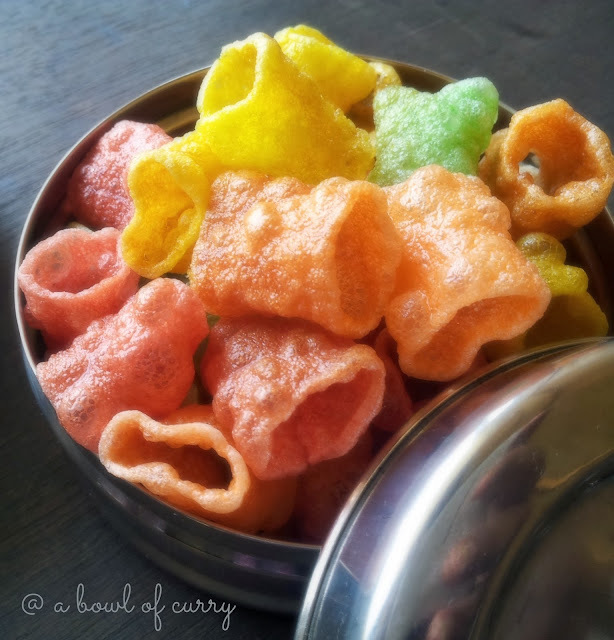 This is one of the important snack served during Iftar (nombhu thura/ breaking the Ramadan fast) in Malabar. 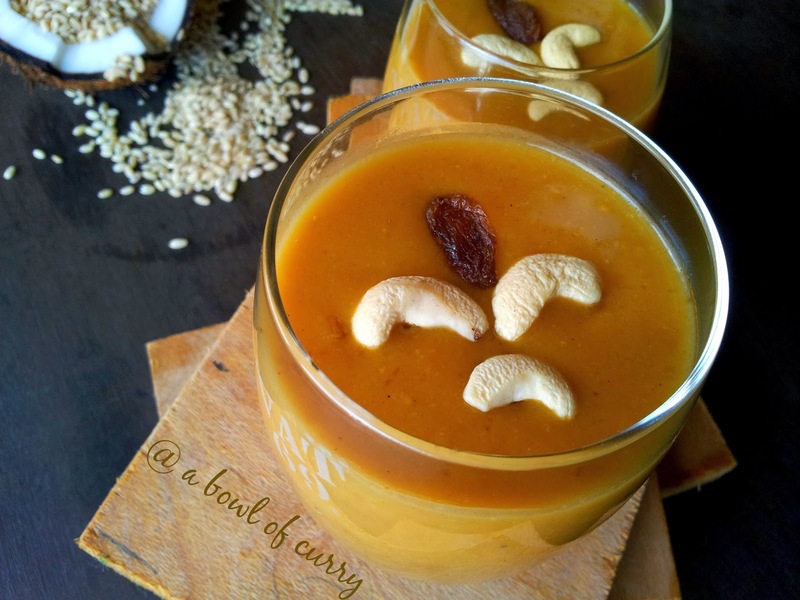 This snack is prepared by stuffing a mixture of coconut , sugar, cardamom, cashews , raisins and sugar. Slit open the plantains and stuff the filling and shallow fry in oil. 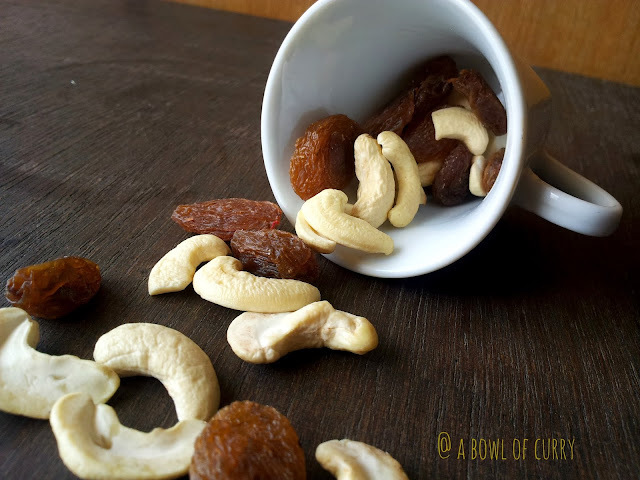 Heat ghee in a frying pan, add the chopped cashew nuts until golden brown. Transfer them to a paper towel. Add the raisins, let them puff up like cute little balls. Remove them to the paper towel before they get charred. Keep aside. To this ghee add the grated coconut, saute for 2-3 minutes add sugar and crushed cardamom. Mix the cashew nuts and raisins and keep the filling aside. In a bowl mix maida , salt and water to make a thick paste to cover the slits of the banana. Now peel the plantains. 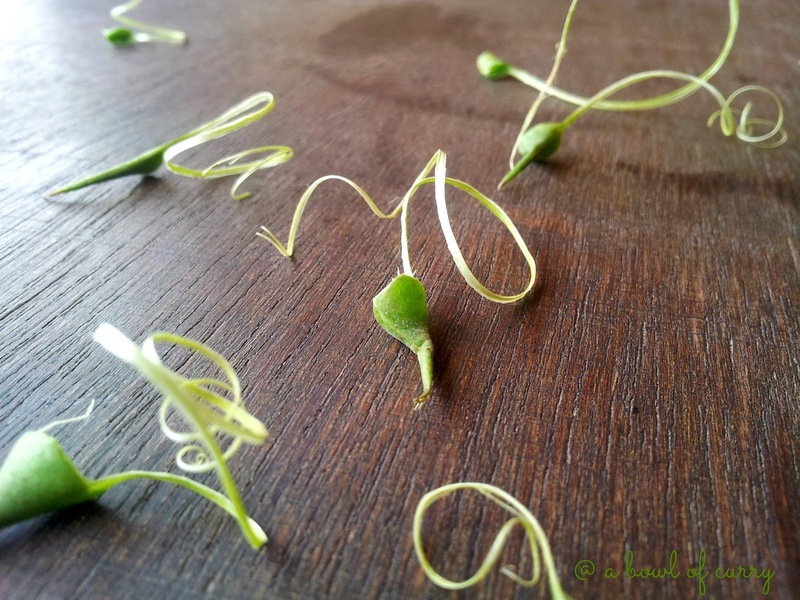 Make a shallow slit lengthwise in the center of the plantain. The depth of the slit should be made until it reaches the center of the plantain. (Do not cut open the slit.). Now make another slit nearer to that, about 2 inches width. Remove the piece from the banana. Now using spoon , fill in the prepared coconut mixture into that gap. Press them tight using your fingers. 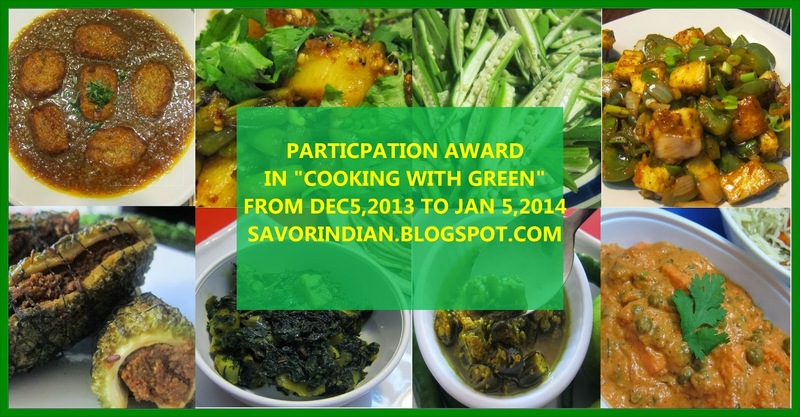 Now cover it with the piece that you have removed from the plantain.Seal the gap with the maida paste. 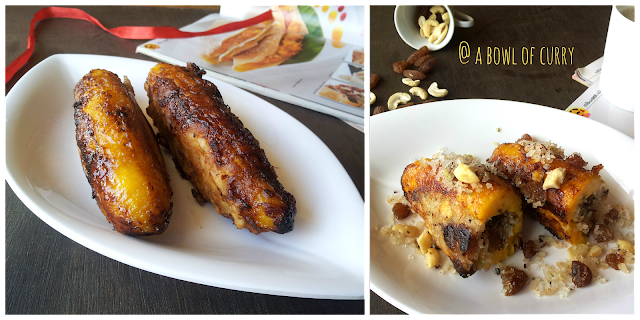 Repeat the same with the other plantains. Heat oil in a kadai/ non-stick pan for frying on a medium flame. 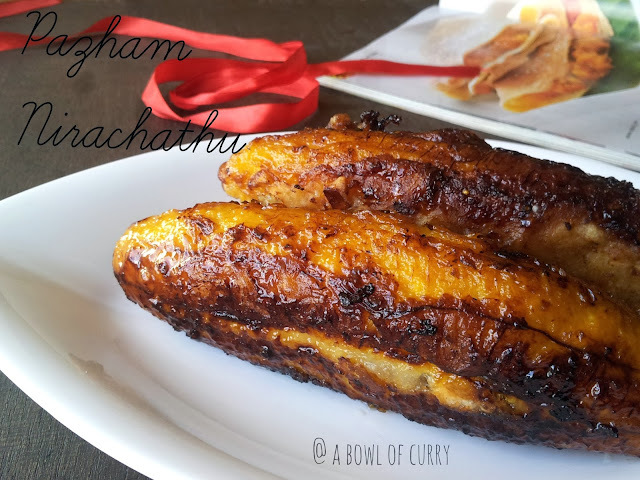 Fry the stuffed plantains, until golden brown. Carefully flip the sides in between. Drain them on a kitchen towel. 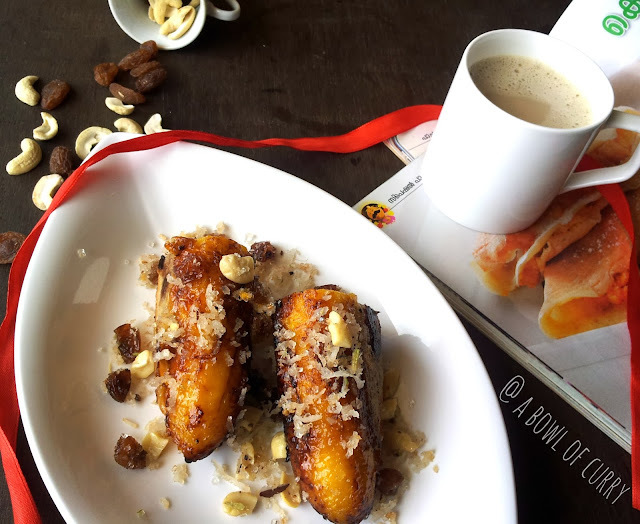 Sere it hot with a cup of tea / coffee..
Do not use too ripe plantains, as it will absorb too much oil and hard to hold. Wash grapes in fresh water.Soak these grapes in lukewarm water for 1/2 hour. Cool it down. 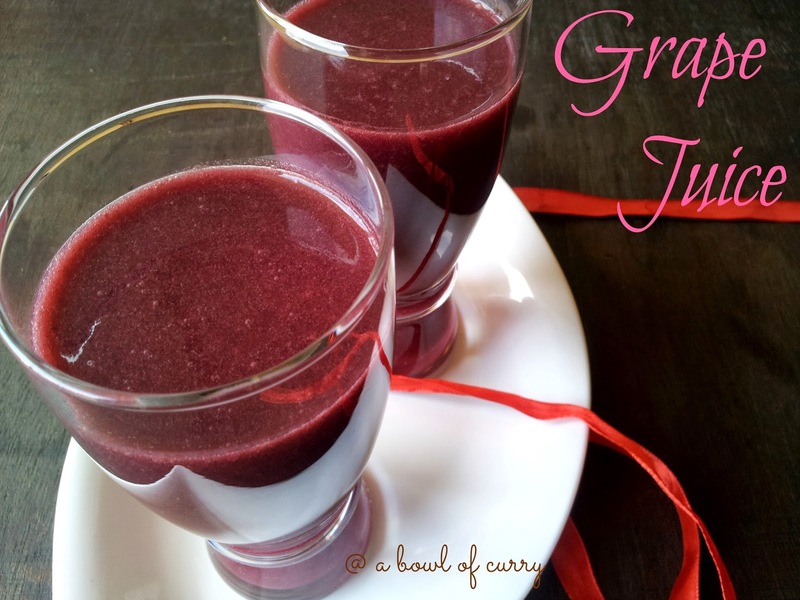 Put the grapes in a blender. Add sugar. 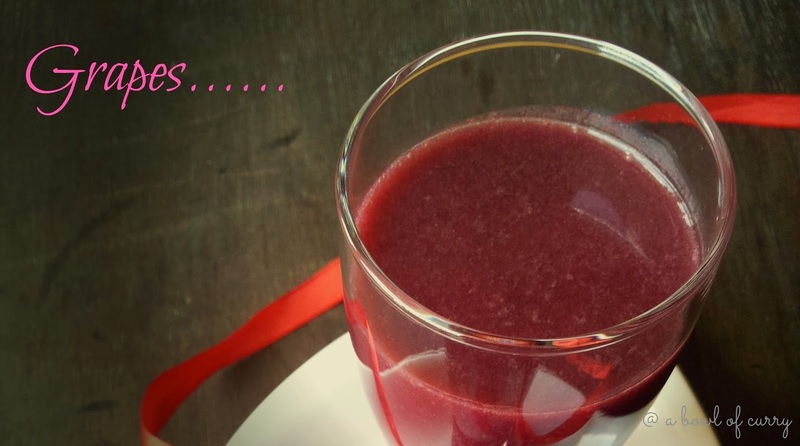 Blend with little water in which grapes was soaked. Add 2-3 ice cubes. Blend it well and filter it. Serve with ice cubes on top. Wash and cut the edges of the plantain.Slice them into thin pieces (but not as thin as for kerala chips). Take some water in a bowl and add a pinch of turmeric powder. Put banana slices into it while slicing itself, so that banana won't change its colour from oxidation. 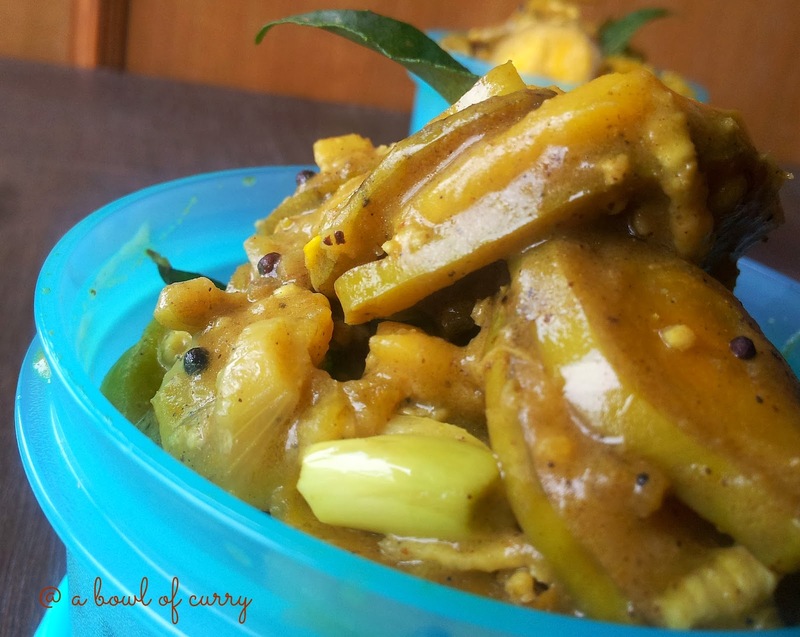 In another bowl, add the sliced bananas,grated coconut, green chilli, pepper powder, turmeric powder, curry leaves and salt. Mix with a spoon. Heat oil in a kadai/ non-stick pan,crackle mustard seeds, add dry red chilli. To his add the masala mixed banana. Pour a cup of water.Mix well. Close the lid and cook, until the banana pieces are soft and well coated with the masala. When cooked, off the flame and add crushed garlic. 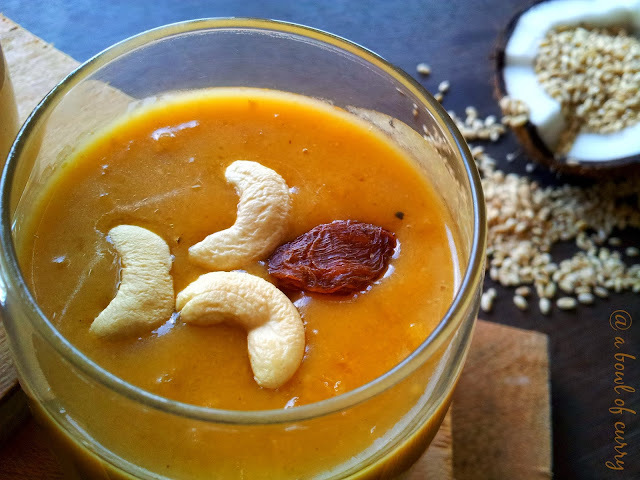 Serve hot with rice, chapathi or any roti, dosa. etc.. 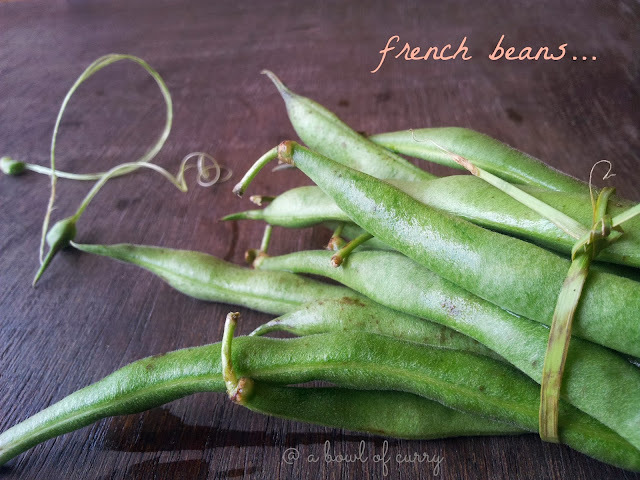 In a bowl, mix cut beans, grated coconut, slit green chilly, chopped onion, turmeric powder and salt, along with curry leaves. Mix with our hand/spoon. Heat a pan/kadai, add coconut oil / oil, splutter mustard seeds, and throw in dry red chilly. Add the prepared mix, mix well. Just sprinkle a tablespoon of water and cover and cook on low flame for about 10 minutes. Stir in between. Check salt. 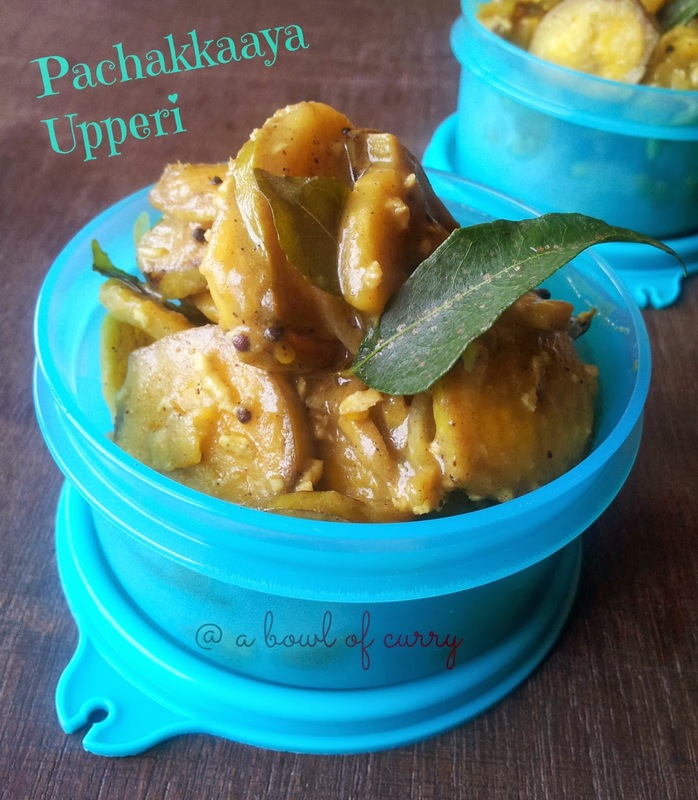 Open the lid and cook until water is all absorbed and 'upperi' is dry. 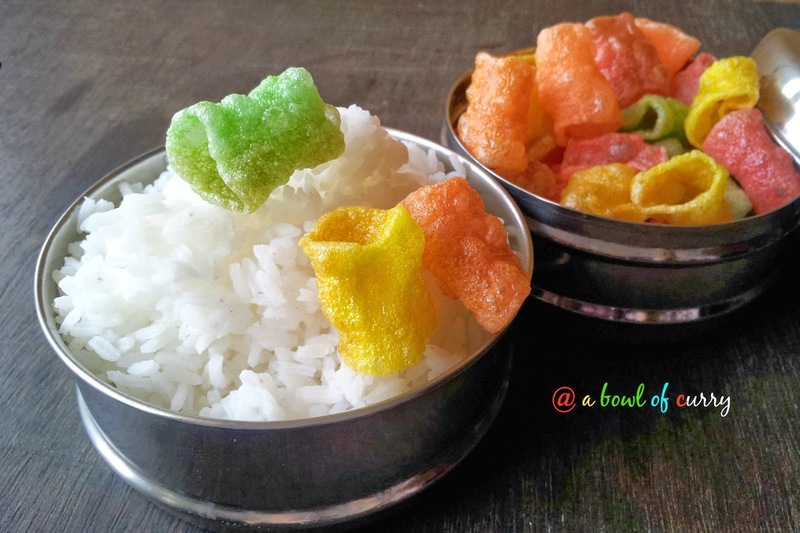 Serve hot with rice in your lunch menu.